Traditional family bar, Serving excellent homemade traditional pub food and homemade Sunday roasts with a good choice of real ales, beers, standard and premium lagers and ciders on tap. Large selection of wines and spirits. Large car park & beer garden. 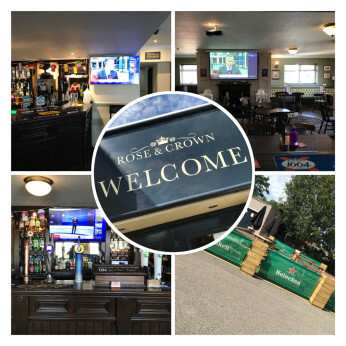 The Rose & Crown was refurbished in 2013 to high standard, We pride ourselves in our warm family friendly environment and well trained and mannered staff. Located on the outskirts of the main village with a large car park and outside beer garden where your children can play safely. Dog friendly, child friendly, cask ales, premium lagers and ciders, spirits, extensive gin range, and we have a games area, live Sky & BT Sports on daily, traditional homemade pub food, daily specials, light menu, background music, weekly buskers every Wednesday evenings and Live music on monthly. BUSKERS NIGHT - HAPPY HOUR! Christmas Day open 12pm till 2:30pm Bar only.